Project P.L.A.Y. School’s mission is to create an environment where the promise of each child can be realized. We are a unique, non-profit pre-school specializing in learning through authentic experiences and nurturing, respectful relationships. We value all that we learned and continue to learn from Tom Drummond. A gifted educator who specializes in relationship building and an authentic way of being with children. We build sincere relationships with children, families and community built on mutual respect, commitment and joy. At Project P.L.A.Y. School children achieve, succeed and grow through heartwarming and caring relationships. We recognize parents as a child’s first teachers — therefore we respect parenting philosophies, using them as tools for learning in the classroom. We reinforce these vital family relationships with community get-togethers to build the intimate nature of our school. Our school’s principles are inspired by the Reggio Emilia approach and constructivist education. 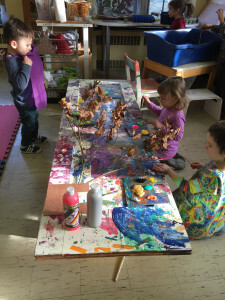 This type of emergent curriculum follows children’s interests and gives the opportunity for children to return again and again to add new insights. We rely on observation and documentation of children’s knowledge, thoughts, and experiences to make learning visible. Children, parents, families, teachers and community are interactive and work together. Children are competent, capable and have unlimited potential. Teachers and children construct knowledge through authentic relationships and negotiated learning. Teachers are facilitators of each child’s learning experience. Time should not set by the clock, but by respect for children’s pace. Relationships remain constant when children stay with the same teachers for several years. At Project P.L.A.Y. School, our environment is the third teacher. Our serene space reflects this approach, and we offer a beautiful atmosphere of discovery. 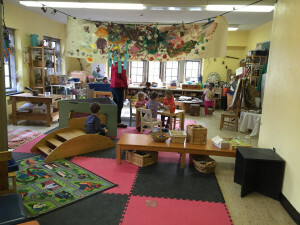 The inspiring supportive environment encourages choice, exploration, collaboration and social interaction. Daily opportunities for creative expression as articulated in the The Hundred Languages of Children are tailored to each child’s needs. These avenues include poetry, painting, sculpture, music, wire, clay and more as inspired by our surroundings. Our children can frequently be seen with clipboards in hand on walks throughout the community as we believe our relationship with the community around us offers opportunities for interactive learning. Outside time is integral to our day at Project P.L.A.Y. school and an extension of the indoor space. The yard is equipped with sand, water, garden boxes, and open spaces for running and group games. 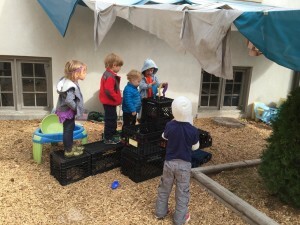 We believe in equipping our outdoor space with open ended materials that allow children the opportunity to re-imagine the space each day during ever changing play scenarios.